On the east side a continuous line of terraced stone cottages, broken only by side streets, with a pub at each end and one in the middle! On the other side Shrigley Court wardened flats, modern brick houses of Vine Street, the redundant St. John’s church within its large churchyard and a dozen 1930s semi-detached houses reaching round the corner towards Lord Street. Church Street ends at the river bridge, not at the end of the straight length of street. Approach off Palmerston Street at the roundabout. Leads to Chapel Street and Harrop Road, Vine Street, Turner Street and Turner Rise, Lowther Street and Sowcar Way, Nancy View, Ingersley Vale, Dyers Close and Mill Lane, Lord Street. Nearest pubs – The Turners, Church House, Crown are within the street. The Cotton Tree is next door to the The Turners in Ingersley Road. Council Ward – East side, East; west side, Central. The cottages in Church Street were built piecemeal and date from different times. At least two of them were built as single story properties and then had a second floor added in brick at a later date. St. John’s church was last used in May 2003. It is to be converted into apartments. Shrigley Court is wardened accommodation for the elderly. It was brick built in 1973 , entirely out of character with the area, to replace an area of slum cottages which comprised Union Street, Vine Street and Hope Street, known collectively as the Square. Vine Street was re-built in the 1970s with brick houses. 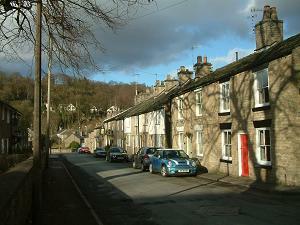 Conservation: This street is in the Bollington Conservation Area. Numbers are subject to Article 4 Direction.